We told you search was "Coming soon.." when we introduced Advanced Views late last week and now, it has arrived in iFreeTools CRM. This comes a day after Instant Details and Customizable Columns were added to Advanced Views. Advanced Views now have a "search as you type" feature, shown in action below.. The search string is matched against values from all the columns in table view. If you want to include a property for the search, just add it as a column of the table and proceed to search. There is also an option to disable "Search while typing", which makes search operations to begin only after clicking on the Search button. This can be useful when using browsers like IE. Keep sending in your feedback on Google App Engine powered iFreeTools CRM. We listen, and more importantly we act and we deliver - fast. 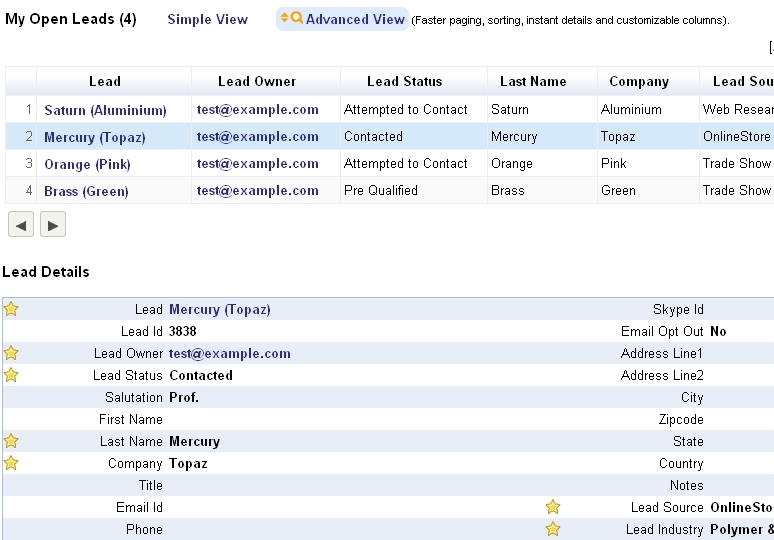 Another upgrade and iFreeTools CRM now has support for Instant Details and Customizable Columns in the Advanced Views. This comes soon after the initial support for Sorting and Faster Paging (Next/Previous), added late last week. With today's upgrade, Advanced View has been made the default list view. If required, one can always switch back to Simple View and the browser will remember your preference the next time list views are loaded. Within the Advanced View, one can now view the details of the records instantly by clicking on the row in the table. When the view loads, you will see something like..
Now click on any row in the table to load the details..
Notice how the visible columns are marked with a star image. You could click on the star (or the property name) to toggle the visibility of the property in the table view. 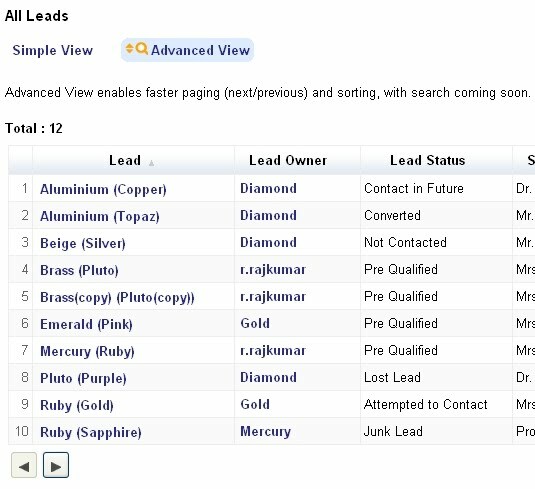 For example, when you want to remove the Salutation and First Name and instead add Lead Source and Lead Industry, click on the relevant property names in the details view and see the changes getting reflected in the table view..
Once the property becomes a column in the table, it can then be used for sorting. Options to save the view settings either for self or as default settings to all users will be available soon. The usual details view is still available, where you can also view the lists of related records. We would be glad to hear from you on what you would like to see in our Google App Engine powered iFreeTools CRM. Check out the features and feel free to send in your feedback. Not being able to sort the data, was one of the pain points expressed by some of our users. So we got working on a quick feature to support sorting of data in the views, while also enabling faster paging. These features are now available as "Advanced Views" in the Google App Engine powered iFreeTools CRM. It is recommended to use Chrome or Firefox (with firebug disabled), to experience this feature. Currently "Advanced Views" is not the default view, as it is still a work in progress. Other upcoming features in the Advanced Views include selectable columns and search. So, what is your pain point ? What would you like to see soon in iFreeTools CRM ? Let us know - you can use the feedback form in the application or send a mail to raj@sahasvat.com. We listen, and more importantly, we act and we deliver. 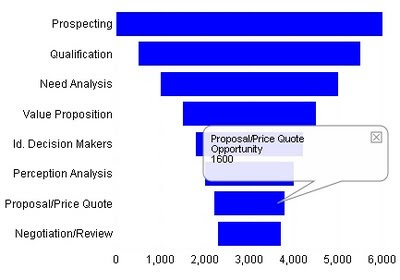 Sales Opportunities Pipeline (Funnel Chart) which was in the works, is now available as part of iFreeTools CRM. This comes after our initial support for charts added in the Leads module. As an additional option, we have also included a horizontal-bar-chart in all chart views. Apart from the Sales Opportunities Pipeline, two more chart views have also been introduced in the Opportunities module, which are Open Opportunities By Source and Open Opportunities By Owner. These charts show the opportunity amount (or potential) aggregated based on source/owner, displayable in Horizontal/Vertical Bar charts or in Pie charts. We would love to hear your feedback on the application. Support for charts was actually taken up earlier than planned, after users got in touch with us requesting for the same. Go ahead and check out the CRM built for Google App Engine / Google Apps and let us know what you would like to see soon in this application. You can use the feedback form in the application or send a mail to raj@sahasvat.com. Google And Its Effects on CRM - You have seen nothing, yet !! 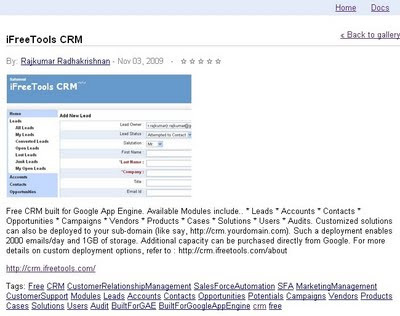 We Blog CRM has post on Google And Its Effects on CRM (a couple of months old). The blog post points out how applications like Google Docs and Calendar can be good CRM tools and goes on to describe how the current players like Salesforce and Zoho CRM are integrating with Google applications. Another aspect of Google's effect on CRM has not been given specific mention and rightfully so, because, though there is a potential in that angle, there were no concrete examples to talk about - at least at the time of that post. One such app to take advantage of the platform is our very own http://crm.ifreetools.com, which came out with the Alpha version less than a month ago and seems to be the only application working to be a full-fledged CRM app, based on those listed in App Engine's Application Gallery. We at iFreeTools believe this will not remain so. There will be a lot more players dropping into the CRM / business software scene, which is now becoming more of a commodity. I had mentioned this in a comment on Zoho's blog titled "Why we compete with Google" - at that time I was still an employee of Zoho (then called, AdventNet). Deploying such App Engine applications on Google Apps domains is as easy as "Add a Service" from the dashboard and then adding a CNAME (DNS entry) to map a sub-domain. But, how far can such apps go ? Will they be able to at least match the core features of the current breed of SaaS applications ? How feature rich can such applications be, given the restrictions inherent in the App Engine platform ? Will Google Wave have a bigger role to play ? All this, we will have to wait and see. All I can say now is, watch out for more of Google's effects on CRM. 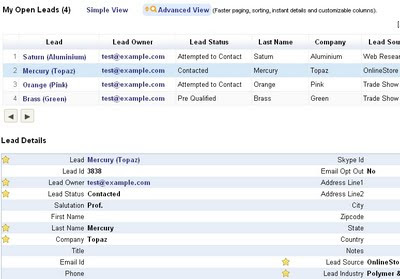 Yes, that is what's cooking at CRM for App Engine - iFreeTools CRM. 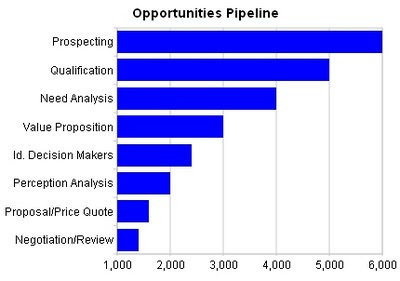 The Opportunities Pipeline Chart (aka Sales Potentials Funnel chart) is a standard chart in almost all CRM application. iFreeTools is now working towards providing the same as part of the next upgrade. The problem with adding a dummy column is, that space is click-able and can confuse users about the actual value..
Let me see what I can do. Until then, have a nice weekend !! And, as always, feel free to send in your suggestions to me, on what you want to see added soon, in iFreeTools CRM. iFreeTools CRM, the CRM built for Google App Engine (and hence for Google Apps), just had an upgrade which adds support for charts in the hosted CRM application. 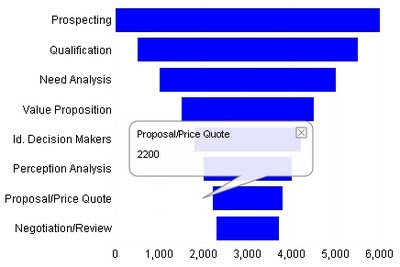 This first step towards broader reporting features in iFreeTools CRM, begins with charts added to the Leads Module. 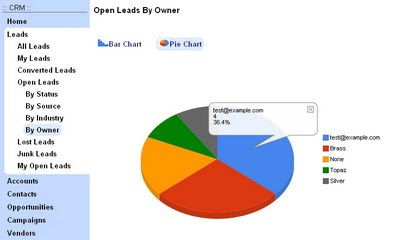 Now, under Open Leads, the following chart views have been added..
Each chart view has an option to view the summary in either bar-chart format (loaded by default) or a pie-chart format. Note : In case you are using Firefox, make sure Firebug is disabled when using these charts as Firebug is known to slow down this charting feature. Send in your feedback on what charts you would like to have as part of the application and we would add them in subsequent upgrades. Within this short duration of less than month, iFreeTools CRM (alpha) has attracted a lot of users from across the world. They like the pace at which features are getting added and the personalized support. A few of them have already rebranded and mapped the application to their Google Apps domain. So, go ahead start using the application and feel free to send in your feedback on what you would like to see soon in iFreeTools CRM. As part of rebranding iFreeTools CRM, you may now provide the URL for your logo, to be displayed in the header of the CRM application. The URL can directly point to the logo on your website - example : http://www.mydomain.com/static/images/logo.png . Uploading images to iFreeTools is not supported, for now. To help your logo blend with the application, you may choose a header out of "default", "cloud" or "full-white", so as to match your logo better. Transparent PNG logos are also supported. The following samples show the use of a transparent PNG logo, used for rebranding with the 3 different headers..
Also, you may include the rebranding text (organization name, appName1 and appName2) along with smaller logos, as shown below.. Check out the features and feel free to send in your feedback on our Free CRM for Google Apps. Google has been migrating this feature out of Google Apps to Google Cloud Console and if you domain was migrated to the latest version of Google Apps, this feature may not be available for configuration any longer. You will still be able to go in for a paid single-tenant deployment of iFreeTools (starts at $99/year for up to 25 users), where you will get access to the Google Cloud Console of your iFreeTools deployment and can map the application to any domain (the domain need not be associated with Google Apps). Yet another upgrade just happened at CRM for Google App Engine. This upgrade enables mapping of iFreeTools CRM service to one of your sub-domains and also to configure it with simple rebranding. 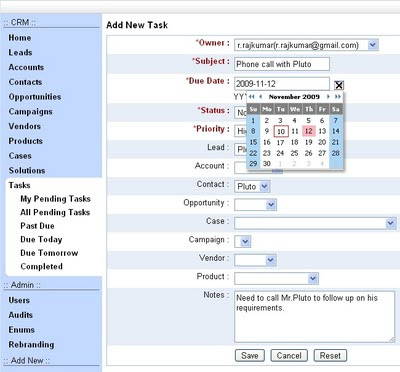 The details provided here are also applicable to iFreeTools Creator, our online database app builder for Google Apps. 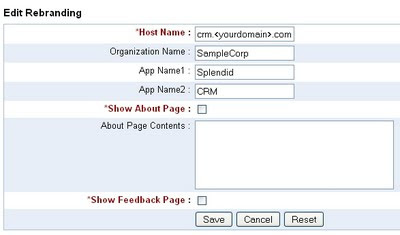 To enable sub-domain mapping, like say http://crm.yourdomain.com, you will require to enable Google Apps for your domain and add iFreeTools app as a service. In the old version of the Google Apps dashboard, you can click on the Get more apps and services link under Common Tasks. 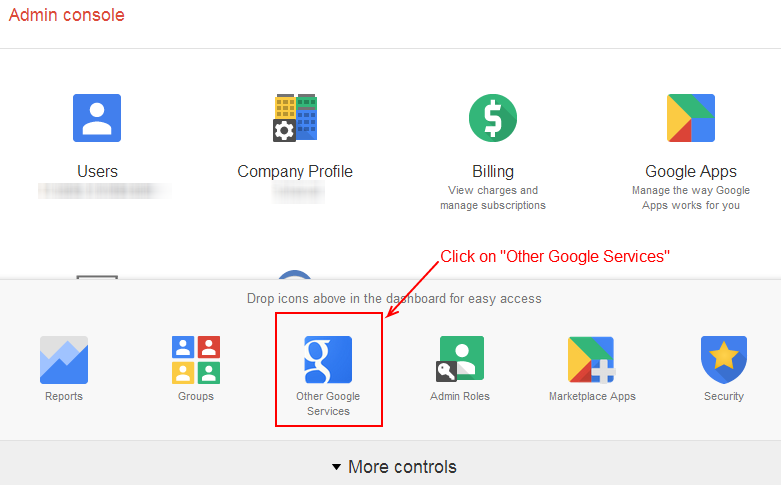 In the new version of the Google Apps dashboard, you can click on Other Google Services control. If you are not seeing this control, kindly try More Controls option at the bottom of the page. You may now proceed to configure your sub-domain, by configuring the Web address, as shown below. You may also be required to add CNAME entries in your DNS configuration to map to ghs.google.com. These steps are not covered here. Kindly follow steps as detailed in Google Apps. After the web-address is configured and the CNAME entries are added, you should be able to access iFreeTools service from the configured sub-domain. When you login into the application, you will see the header with default configuration having values which suggest you to make changes (currently it will be something like "Your-Biz-Name-Here").. Proceed to Admin::App Settings to view the default settings currently used by the application, which will be similar to the one given below..
Now proceed to modify the configuration. Notice that About Page and Feedback Page have been disabled (unchecked) as part of Rebranding..
And after the modified app settings takes effect, you will see the specified names being used in the header and that the About and Feedback links are removed from the application..
As of now, feedback mails when enabled (with "Show Feedback Page" as True) will be sent to ifreetools.com, behaviour of which will be modified soon. Hope you like the new features. Play with the app and feel free to send in your feedback on iFreeTools CRM. 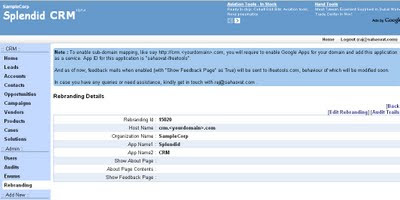 iFreeTools CRM (alpha) - the CRM for Google AppEngine, just got an upgrade. With this upgrade, iFreeTools CRM has added support for defining enumerated values for selection fields. Admin users can now define Enum values to be listed for the following selection fields..
For using this option, go to the Enum module under Admin and add comma-separated values for the fields. If no Enum is defined for a property, the default application level settings will be used. Defining of Enum has been disabled for the following fields, since they are used in pre-defined views. Also, currently you will have to configure values for attribute for different modules individually. 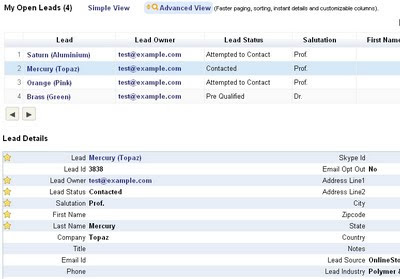 Example lead.leadSource, contact.leadSource and opportunity.leadSource will have to be configured individually. Since it is a one-time admin operation, we assumed it will be OK. Probably at a later date, we can provide a even more easier option to define once and refer in more than one field. Check out the feature and feel free to send in your feedback on our Free CRM application. 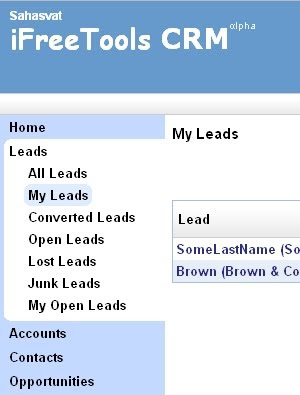 Customized solutions over iFreeTools CRM can also be deployed to your sub-domain (like say, http://crm.yourdomain.com). Such a deployment enables 2000 emails/day and 1GB of storage. Additional capacity can be purchased directly from Google. iFreeTools CRM (alpha) - the CRM for Google AppEngine, just got an upgrade. 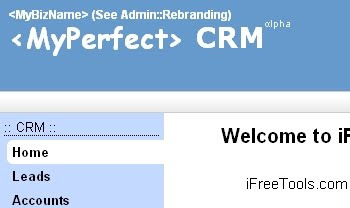 With this upgrade, iFreeTools CRM has added support for.. Authorization will be based on the user roles, currently limited to "admin", "user" and "guest". Audit records will be automatically added for all completed write operations and for attempts to perform unauthorized operations. Audit records cannot be added, edited or deleted directly by users and any attempts to do so will also be audited. Apart from Audit data, authorization for views and actions are as listed below..
viewing of records in all modules. First cut support for views is now in. 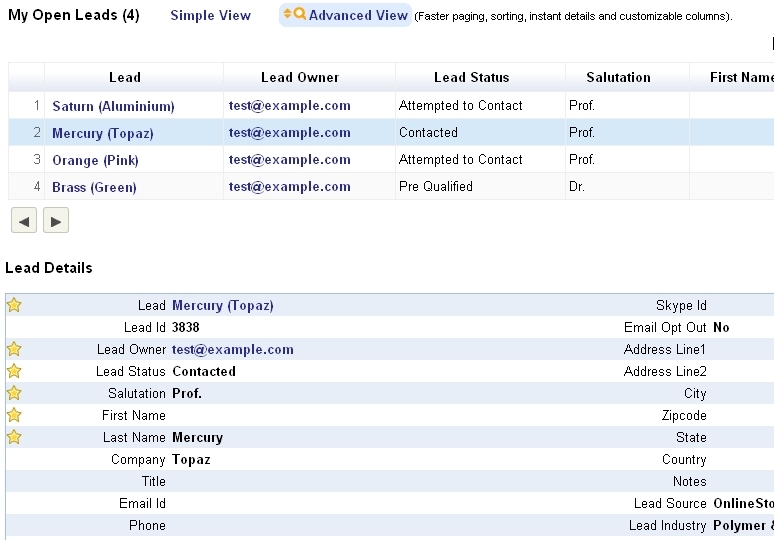 All modules by default will have minimum of two views, one to view all records (example : All Leads, All Accounts, etc.,.) 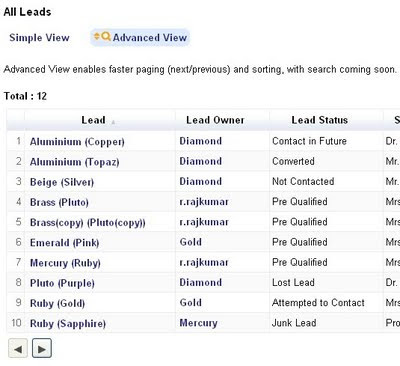 and one to view records related to them (My Leads, My Accounts, etc.,.). Apart from these 2 views, pre-defined views specific to the module have also been provided. For Leads the additional views are.. The left-side tab-based navigation has been modified to include such views..
Go ahead and check out the features and send in your feedback. BTW, the ads just got smaller on our free CRM application.. So, you will see lesser distractions from competitors of iFreeTools.